In latest belligerent move, Iranian state television airs documentary showing simulated missile attacks on Israel, US. Iranian state television ran a documentary showing simulated air attacks on Israel and the United States Friday, as revealed in an inflammatory clip uploaded to YouTube. The clip shows Iranian drones and missiles carrying out simulated strikes on the American aircraft carrier USS Abraham Lincoln, striking American military targets in the Persian Gulf and downing US aircraft. In a more graphic part of the documentary, drones and missiles are shown bombing Haifa, Ben-Gurion Airport, and the Dimona nuclear reactor. It was aired just one day before Iran's Revolutionary Guard issued threats Saturday, warning the US that its drones and missiles could reach American vessels in the Persian Gulf. Featured throughout the documentary are clips from the Islamic Republic's Supreme Leader, Ayatollah Ali Khamenei, making threatening remarks against both countries in a 2011 speech. The documentary is not the first to be aired depicting military strikes on Israel. 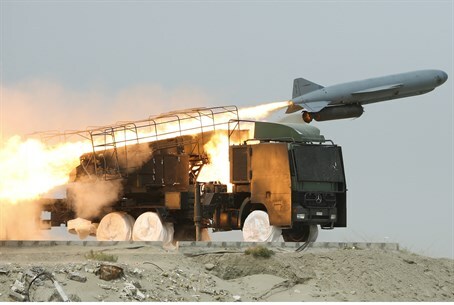 In November, clips aired on Iranian state television showing a simulated missile strike on Israel, including in Tel Aviv. The clips surface at a particularly trying time between the US and Iran. Tensions between the two countries continue to escalate, despite Iran's alleged "charm offensive" against Israel and other Western powers. Ayatollah Ali Khamenei verbally attacked the US earlier Saturday, calling it "controlling and meddlesome" and taunting that it is unable to topple the Islamic Republic. Khamenei recently threatened the United States, suggesting that the Americans “exercise self-restraint,” after Secretary of State John Kerry said that the military option was still on the table if Iran fails to live up to its part of the agreement that was signed with it in Geneva. Senior parliamentary officials in Tehran also denounced Kerry’s remarks and threatened a “crushing response” if the United States attacked Iran. Prime Minister Binyamin Netanyahu reiterated the importance of keeping vigilant with the Islamic Republic during his weekly cabinet meeting Sunday. "The international easing of the sanctions against Iran have not led Iran to moderate its international aggression; the complete opposite has occurred," he noted. "The Iranian Foreign Minister recently met with the head of Islamic Jihad, Iran is continuing to supply terrorist organizations with deadly weapons, Iran continues to be complicit in massacres in Syria and to all this may be added the leader of Iran's crude and sharp attack against the US, alongside sending warships to the Atlantic Ocean." "What is happening here is that the international community has reduced the sanctions on Iran and Iran is stepping up its international aggression," Netanyahu summarized. "This is the real result of the steps up until now."